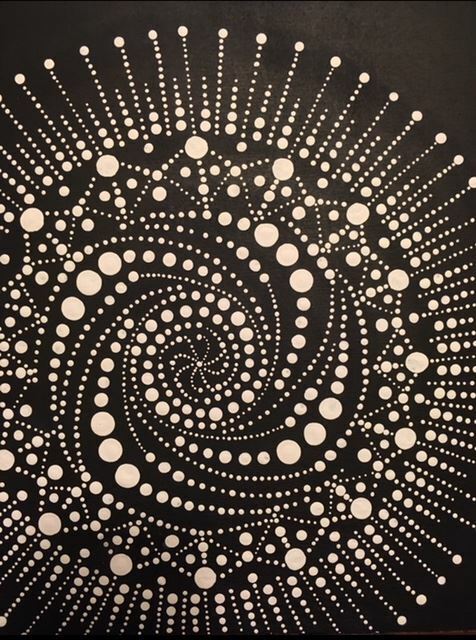 Explore pattern and design through the use of dots inspired by Aboriginal Dot Art! With patience, focus and attention to detail dynamic designs will be achieved using acrylic paint and dot making tools. Participants will create design based paintings using dots. Emphasis will be on size variation of dots, repetition of pattern, balance and symmetry, and creating movement within pattern and design. Jordan Eveland is a Fine Arts graduate from Fanshawe College in London, Ontario. As a mixed media artist, Jordan works with clay, wax and paint and is always excited to learn and share new art techniques. Jordan has lived in Creemore for 12 years and has been facilitating art workshops as well as children’s in school and art “camp” programs for the past 10 years. Working with children and helping them to explore their own creative passions with unique “hands on” experiences has been an inspiration. Jordan hopes to continue to help children broaden their artistic exploration and to learn from their amazing creativity as well!